Nearly everyone is deficient in one or more vitamins or minerals. Studies show that deficiency standards are too low and many individuals have even higher needs. REMEMBER though, taking poor quality nutrients or too much of a good one is not healthy. 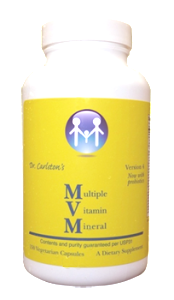 Developed by a medical doctor who has studied and used nutritional therapy with patients for over 35 years, Dr. Carlston’s MVM is produced to the highest quality standards, with ideal nutrient levels targeted to help most adults. 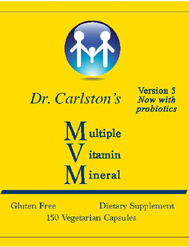 Dr. Carlston’s MVM is continually updated to take advantage of the latest nutritional research and contains nutrients in their optimal forms for greatest effect with best tolerance. High levels of D3 to combat the most widespread vitamin deficiency. With polyphenols, natural carotenoids, CoQ10, resveratrol & other important nutrients. Hypoallergenic – no yeast, wheat, gluten, soy protein, milk/dairy, corn, sugar or starch. 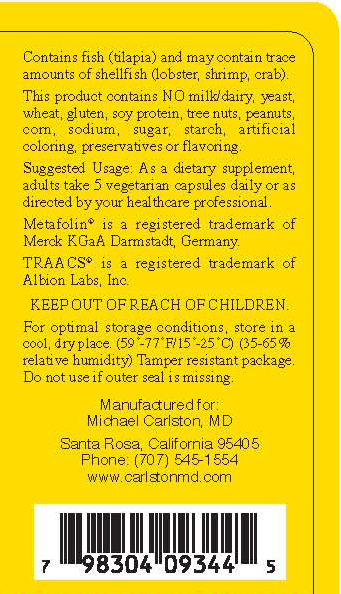 Vegetarian capsules. No artificial coloring, preservatives or flavoring. Contents and purity guaranteed per USP 31. Vitamin A – Supplied as nontoxic precursor forms, mixed natural carotenoids. Vitamin C – Included in both water soluble and the often ignored fat soluble form. Vitamin D – Provided at high levels in its most effective form. Vital for so many diseases, health condition and athletic performance. 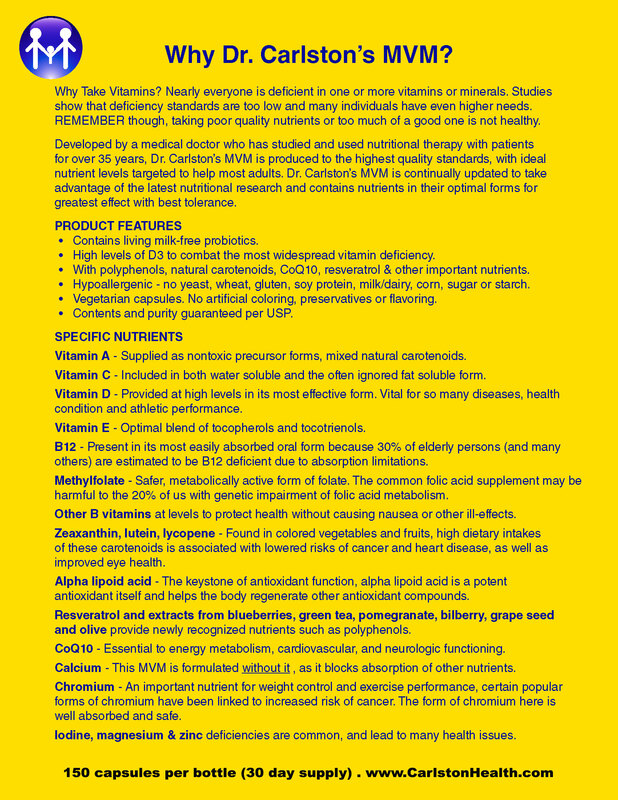 Vitamin E – Optimal blend of tocopherols and tocotrienols. B12 – Present in its most easily absorbed oral form because 30% of elderly persons (and many others) are estimated to be B12 deficient due to absorption limitations. Methylfolate -Safer, metabolic active form of folate. The common folic acid supplement may be harmful to the 20% of us with genetic impairment of folic acid metabolism. Other B vitamins at levels to protect health without causing nausea or other ill-effects. Zeaxanthin, lutein, lycopene – Found in colored vegetables and fruits, high dietary intakes of these carotenoids is associated with lowered risks of cancer and heart disease, as well as improved eye health. Alpha lipoid acid – The keystone of antioxidant function, alpha lipoid acid is a potent antioxidant itself and helps the body regenerate other antioxidant compounds. Resveratrol and extracts from blueberries, green tea, pomegranate, bilberry, grape seed and olive provide newly recognized nutrients such as polyphenols. CoQ10 – Essential to energy metabolism, cardiovascular, and neurologic functioning. Calcium – This MVM is formulated without it as it blocks absorption of other nutrients. Chromium – An important nutrient for weight control and exercise performance, certain popular forms of chromium have been linked to increased risk of cancer. The form of chromium here is well absorbed and safe. Iodine, magnesium & zinc deficiencies are common, and lead to many health issues.